Learning to write my counter thoughts. Remember the good old days of Scary Tomato's Weblog? 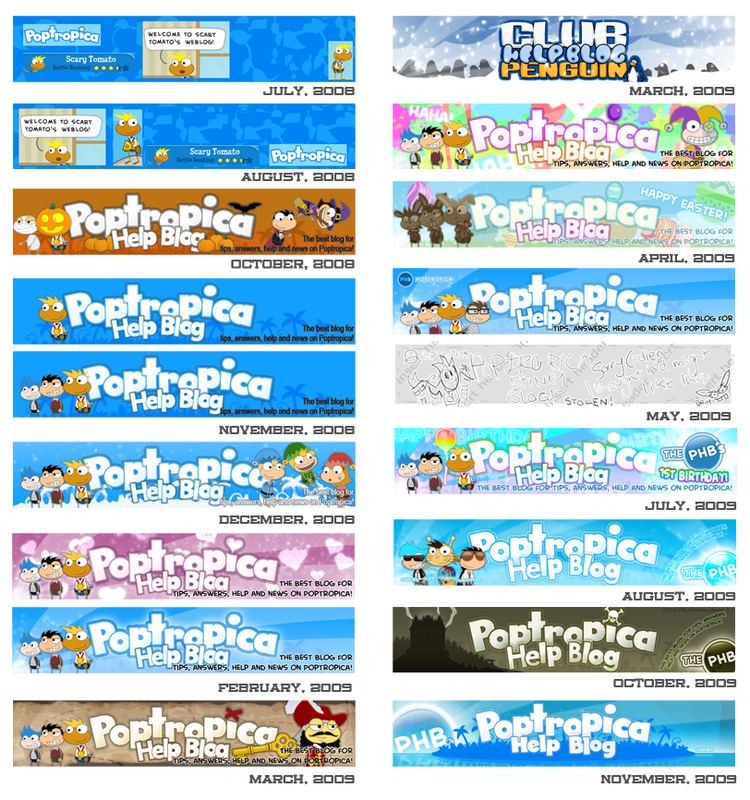 If you know your PHB history, you know that the founder, Hijuyo, used to be known as Scary Tomato, whose Poptropican was pictured in its very first blog header (shown above for your reference), back when ST/Hijuyo’s graphics weren’t all that great. A few months later, along came Codien. He became the third author to join the team, after Smockers, and began sprucing up the place by creating amazing graphics for the site and even renaming it from ‘Scary Tomato’s Weblog’ to ‘Poptropica Help Blog’ – what we still know it as today. And although he left the team, Codien’s missed us and is back to posting and being the awesome graphics guy – that part is not a joke! Coming back just in time for April Fool’s Day 2011, he quickly came up with the idea of triggering back some old memories as part of the prank – by putting the very first header up and once again changing the site name to Scary Tomato’s Weblog! P.S. 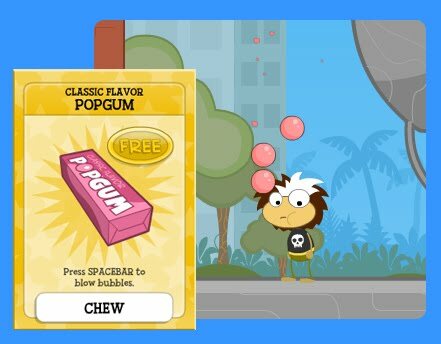 Wondering what Poptropica did for April Fool’s Day at the same time? 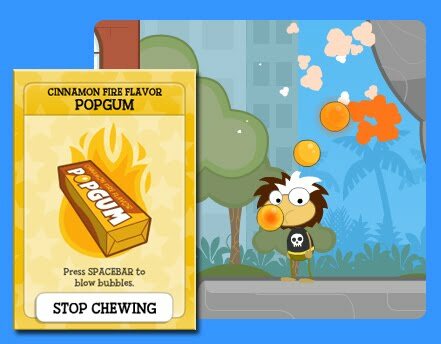 Check out the new ‘Prank Can’ gold card available at the Poptropica Store! How nice you have treated me during these unforgettable years. I am sad to say that the PHB will no longer be with me, only apart of my memories that i will forever remember. Thank-you Scary Tomato, or Hijuyo. Thank-you for giving me the chance to help create the wonderful community surrounding the PHB. I loved what i did. I wish i could continue, but my studies have caught up to me and reality beats virtuality. I have made many friends, and to you i say thank-you for making me smile, and enjoy what i do. I will still be around. Popping in once and a while. I will continue to develop my blog to what i dreamed of. Stay with me. Remember me. You’ve probably been sitting alone, staring at the ominous blinking screen – waiting, waiting for something new to come along. And now you can have it all because you don’t have to be a member to get want you want. If you sit and be patient all good things will come to you… Is that how the saying goes? Announcing the arrival of Mythology Island: now online to everyone! Hijuyo here! The two mysterious members-only cards have been revealed to be a “Skullduggery Teaser Trailer” exclusive video clip and “Skullduggery Pirate” costume. First, the free one. It’s called the Classic Flavor Popgum, and you can blow floating, popping bubbles by pressing the space bar. This one is pink, and a demo version of the other gum mentioned below. And the one that costs. D: This is the Cinnamon Fire Flavor Popgum, and like the first, it blows/floats/pops (in sequence) bubbles by pressing the space bar. These bubbles explode in puffs of fire (as seen in the picture), and cost 250 credits (or free if you’re a member). After many many days of going over hundreds of entries i have narrowed it down to the final 45 winners. Congratulations to our fabulous winners there ideas were certainly crazy. You each receive your very own beard for your Poptropican. I have sent you all an email to the address you provided in your entry. The quicker you reply the quicker you get your prize. Thank-you to all the people that entered. You all did have crazy ideas but only some really stood out. View our recent posts down below. Theres plenty of new leaks and sneak peeks about Counterfeit Island. 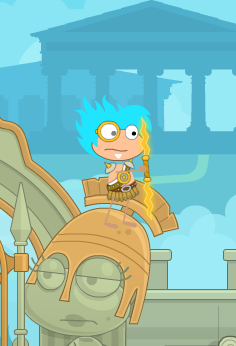 Styling of hair has been a big thing in Poptropica for the past years. But as of yet the creation of a beard has not been a hit. Whether it’s that pre-pubescent children just cant manage to sprout a few hairs on their chin, or 8 – 15 year olds can’t even get the option to customize those golden bearded curls. This will all change due to the new product by Codien called ‘Spray on Beard’. A beard in a can, how remarkable, just point cans nozzle towards ones desired area and press down firmly. Instant beard. A quality product tested by profound scientists, they all agree it’s safe to use. Here’s what a random tester thought, “The perfect thing i need for my Poptropican. It’s Great”. Codien is giving you the chance to get a beard just in time for Christmas. Only 30 45 will get one so head over to his blog now to enter. Hurry, the competition ends on Friday, December 11th! There’s a new Phineas and Ferb advertisement mini-game on Main Street for all ages. Thanks to dancingstarlet for the update. Over the lifespan of the PHB I have designed headers for special occasions to lift the mood on the internet. My style has changed, the quality has improved, and finally all my headers can be showcased on display at my DeviantART Page. Were you here to see all of them? Hello all, it’s been too long. For everyone new that does not know me i’m Codien the graphics guy here at the PHB. I’ve been having exams and too much work to focus on this site, but don’t worry i’m off school in only 2 more days, then you will have me all to yourselves for as long as you want. Just don’t kill me. A third thing to add to this small yet charming post is a small secret brewing in the Poptropica underground world. The creators are busily making a new thing that not even i can talk about! All i can say is it involves a profile and a ranking system and different options of what food you like, favorite color, how many games you’ve won, and thats pretty much everything there doing.